Above Photo: Ahed in Ofer military court in February in the West Bank village of Betunia. When they left prison on Sunday Ahed Tamimi and her mother Nariman received a hard-earned heros’ welcome from Palestinians and others opposed to Israel’s occupation and colonization of Palestinian lands seized in 1948 and enlarged by the Israeli army in 1967. Ahed was 16 years old last December when an Israeli soldier shot her cousin in the face. The next day Israeli soldiers menacingly showed up at her house in the West Bank village of Nabi Saleh. What would you do? The Israeli authorities are so worried about the symbol for resistance that Ahed has become internationally that on Saturday, a day before her release, they arrested two Italian artists who had painted a large portrait of her on the separation wall near Bethlehem. Most Americans — except for the relatively few who have spent more than a few days in Israeli-occupied territories — find it hard to understand why Palestinians like Nariman and Ahed “persist.” Most people in the U.S. are blissfully unaware of the history of Palestine and of the continuing injustices inflicted on its people today. The explanation for this lies largely in the way the U.S. mass media reports the story, almost entirely from the Israelis’ point of view. For those malnourished on Establishment media, here’s a bit of history, without which it is impossible to understand the anger and the courage-against-all-odds shown by those who continue to use what they have — even their open palms — to make clear that they will never acquiesce in Israeli occupation. The Israeli attack starting the Six-Day War in early June 1967 fits snugly into the category of “war of aggression” as defined by the post-WWII Nuremberg Tribunal. “Pre-emptive” attacks, when there is nothing to pre-empt, are now — post Iraq war — labeled more euphemistically as “wars of choice,” but that too fits the Nuremberg definition. 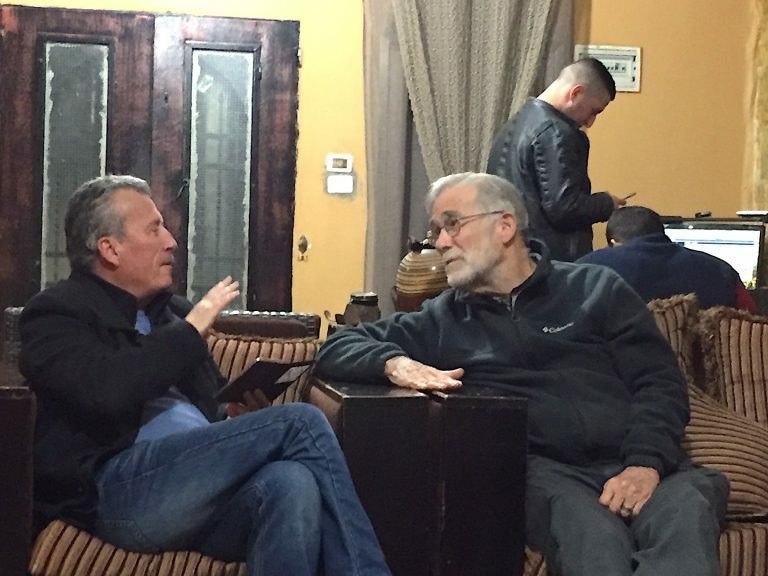 Bassem Tamimi and Ray McGovern in Nabi Saleh last year. And now, a half-century after its successful six-day war of aggression with U.S. backing, Israel has been unlawfully colonizing the occupied territories, oppressing the Palestinians still living there, and thumbing its nose at UN Security Council Resolution 242. It was approved unanimously on Nov. 22, 1967, calling on Israel to withdraw from the lands it seized in June of that year. That was then. In February—March 2017, I was part of a a small Veterans For Peace delegation in Palestine. One of our last visits was to a village named Nabi Saleh, where Ahed’s father Bassem Tamimi, his wife Nariman, and Ahed’s three siblings live when they are not in prison. Her older brother is in prison now. After two weeks of experiencing what life is like for Palestinians under Israeli occupation in the West Bank, I had a chance to ask Bassem about the nonviolent, but frontal, resistance to Israeli occupation and colonization. “Your sons have been beaten and badly wounded and one’s still in prison; your wife is in and out of prison: your brother-in-law was killed by a sniper bullet; you yourself have been tortured in prison; your house is on the list for demolition — why do you persist; why encourage such actions?” I asked. 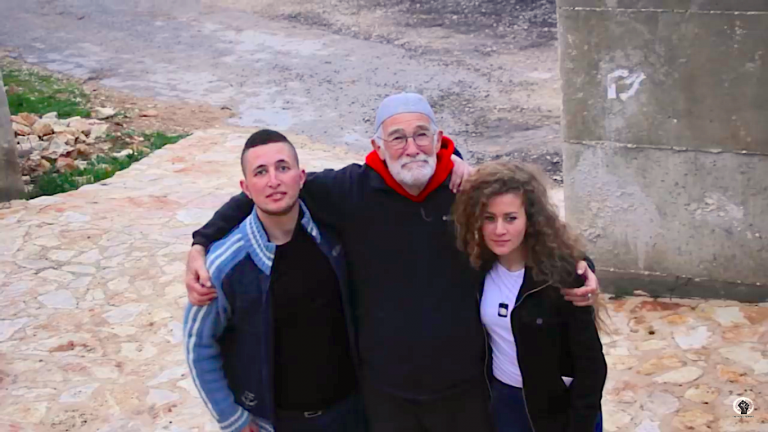 Ray McGovern with Ahed Tamimi and unnamed villager after teens in Nabi Saleh fought off Israeli soldiers. The following day we Veterans For Peace took part in a protest march to the separation Wall. Later, underneath the tear-gas and sheltered from the ensuing rifle fire, we watched the teens of Nabi Saleh dodge the Israeli soldiers chasing them through the village for two hours. When the Israeli soldiers, so heavily burdened with weaponry they could hardly run, finally went back behind their Wall, the young folk emerged shouting, “We won.” It was a privilege to be there to welcome them back to the Tamimi house and some relative peace and quiet. Ahed “Didn’t Get It From the Moon”. This is the expression my Irish grandmother would use to make it clear that tribute and praise should go to the seed-sowers as well as the protagonists themselves. Other traditions use some variant of: “The apple does not fall far from the tree.” Suffice it to say that, from what I was able to witness of the attitude and behavior of Ahed and her three brothers, they are clearly determined to honor the rich legacy of courage and Palestinian patriotism they inherit from Bassem and Nariman — and not only from them. One might say that Ahed and her siblings are honor graduates of the Bassem/Nariman Folk School, just as Rosa Parks was a graduate of The Highlander Folk School. The common curriculum has to do with courageous persistence in the pursuit of justice. Moreover, our delegation was to discover that Rosa Parks is a revered figure in the Israeli Knesset — well, at least in the modest conference room allocated to Arab members. Welcome home, Ahed and Nariman.